Are water firms ready for winter? Extreme weather has hit water companies hard of late, most notoriously the Beast from the East. Are they prepared for the coming winter? 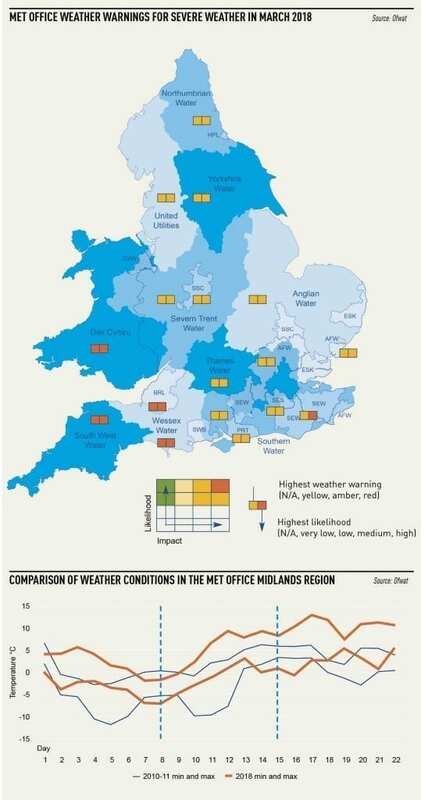 Water companies have been battered by some pretty extreme weather. The past year has been especially testing of their resilience to such events. No sooner had they recovered from the rapid freeze and thaw brought about by the so-called Beast from the East – which cut off more than 200,000 customers from supply for more than four hours – did they have to cope with some of the driest weather the UK has ever seen. Now as we head into the winter, and some of the more dramatic national newspapers scream excitedly about the “return of the Beast”, all eyes will be on water companies to see how they respond. Khaldi warns companies to make sure their planning and systems are ready for winter, or else be prepared to defend themselves against charges of failing to meet their statutory obligations. Ofwat made no bones about its disappointment at the response of some companies to the freeze-thaw incident, especially because the severe weather was forecast in advance. A spokesperson for the regulator says it expects all companies to “show they have learned lessons and are prepared for whatever the weather brings”. “We also expect the water industry as a whole to transform how it works together in situations like these and show it can pull together to deliver for customers,” they add. Cold weather brings with it the threat of pipe bursts as water freezes and expands. And it’s not just pipes on water companies’ networks that can burst. In many cases, it is pipes on customers’ properties. These customers are often unaware that the pipes are their responsibility, not the water company’s – so it is important that firms get communication right. As if this wasn’t enough to deal with, there is also the issue of vulnerable customers who may need additional support during cold and icy weather, especially in the event of disruption to supplies. Are companies ready for a potential onslaught coming their way? It certainly seems so. But their preparedness will undoubtedly be put to the test as the weather worsens and the nights draw in. Wessex Water began its preparations for winter back in the summer. “Every year our preparations for cold weather start in August when we ensure we have the right vehicles and equipment in place for engineers to fix problems and help customers should we face extreme conditions,” says a spokesperson. The vast majority of problems the company encountered in the South West ­during the latest extreme weather event were down to customers experiencing problems on pipework that they are responsible for. Wessex’s customer awareness campaign for this winter is already under way and it involves helping customers – in particular those in vulnerable situations – to protect their home by lagging pipes in cold areas, as well as knowing where their stopcock is and ­ensuring it works. United Utilities insists it is ready for whatever the weather throws at it this winter. Resilience manager Niall Clarke says the company has honed its resilience and response to freeze-thaw events over “a number of extreme seasons”. The firm, which supplies seven million people in the North West, was one of the companies praised by Ofwat in a report following the Beast from the East, for its response to the incident – particularly in getting alternative supplies to communities in need. The firm has also expanded the reach of its priority services scheme for vulnerable customers, including a successful data-­sharing trial with Electricity North West, which it says has given it a much better overview of customers most in need of help. Clarke adds: “In terms of response, the weather outlook is a key feature of our daily incident manager meetings, so we are poised to initiate emergency plans from the minute the forecast comes in. That head start means that by the time the cold weather begins we are already prepared for the problems we might encounter with the thaw, with prepared communications for our customers and operational teams at all stages. Like United Utilities, the company is making full use of the priority services register by encouraging its vulnerable customers to sign up, so it can ensure those most in need are still able to access water in the event of severe weather conditions. “While our strong track record for providing reliable and resilient services was put to the test in some extreme weather conditions this year, we were recognised by Ofwat in the Beast from the East report as being a high performer, effectively delivering for our customers within our ‘business as usual’ operations,” says Algaard. During the latest freeze-thaw incident, Anglian Water suffered very few customer supply interruptions. However, the company is not complacent, and says it is ensuring its network is prepared for another severe cold snap this winter. Key to this, it insists, is driving down leakage. Anglian will also be issuing advice to customers to help them wrap up their homes for winter and prevent leaks and bursts on their properties. 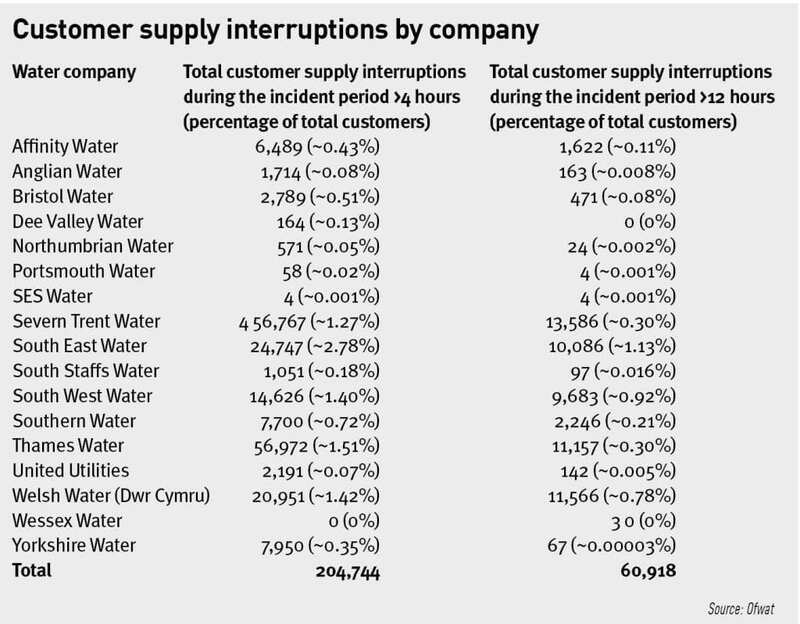 Severn Trent didn’t fare so well in Ofwat’s report. It was highlighted as not being well-prepared for the freeze-thaw. However, the company claims it is prepared for potential pipe bursts brought about by cold weather. It began a fast-tracked recruitment process in July 2018 with the aim of increasing the total number of water network repair gangs, private side repair gangs and water engineers. This has resulted in an increase in its leakage-focused workforce, and further repair gangs will be in place by the end of this month. It has also installed more than 7,500 fixed acoustic loggers in areas of the highest risk within its distribution network, and a further 10,000 are planned to still be installed. Thames, too, was flagged as one of the companies that didn’t perform well during the Beast from the East. The company says it has taken lessons from this and is improving its processes. What’s more, the company is developing real-time digital tools that take into account network information and customer contacts to provide a more detailed view of the impact of storms. This will allow it to react in a faster, proactive, more agile manner. And it has more social media agents working “around the clock”. Elsewhere in the UK, Northern Ireland suffered heavily during the severe weather earlier this year, and Northern Ireland Water says it is prepared for the same again this winter. “We have teams and measures in place should we need them,” says a spokesperson. “NI Water repairs 6,000 burst mains and service pipes every year that are on our pipework. In winter, there can be an increase in defective pipework due to the colder weather.